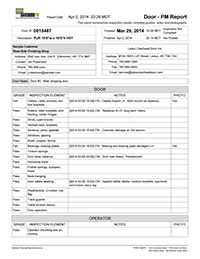 Planned maintenance (PM) and safety compliance program for commercial and industrial door and dock systems. We're an authorized SafedoorPM dealer, and whether you're looking to reduce emergency service calls, optimize door systems' life, or ensure your doors operate safely and within OHS standards, we have the right people, equipment and service options to meet your specific requirements. Why Maintain Your Door Systems? Keep your PM costs down. SafedoorPM's mobile app maximizes technicians' productivity and efficiency to keep your PM costs down. Maintain your doors to the right standards. All SafedoorPM work is based on manufacturers' maintenance specifications and industry best practices. These are the standards that matter for safety compliance, and the operational reliability of your door systems. Help you comply with Alberta's OHS regulations. SafedoorPM specifically address safety device requirements, and is designed to meet OHS Regulations Part 3(12)(d) & Section (2)(1) of the Act. 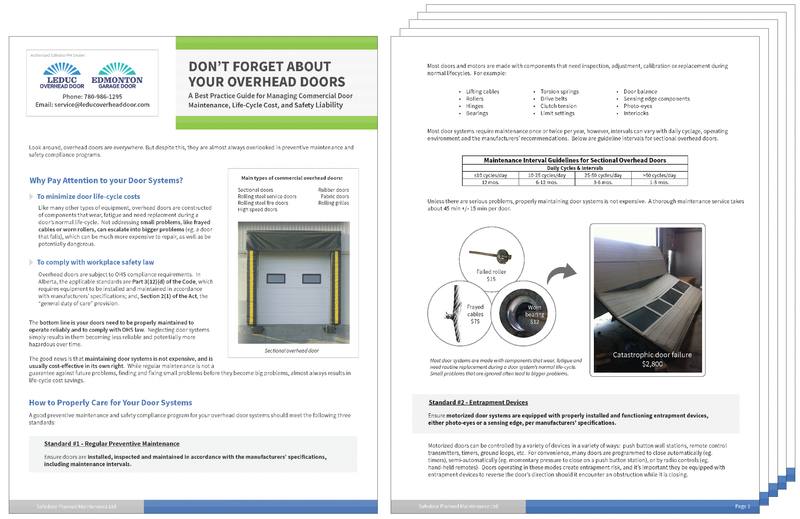 To learn how to properly include overhead doors in your safety program, download the ePaper below. Provide you with detailed PM records, stored securely in the Cloud. and related photographs for a completed SafedoorPM. Phone 780-986-1295 or fill out the online form below to learn more about a PM plan for you.